My friends and I take the BC Ferries Connector bus service from Victoria direct to the Vancouver Cruise Ship Terminal. This is a great service, since once your checked (and tagged) bags are on the bus, they will be delivered right to your cabin on the ship! Since there are quite a few tour groups jamming the ship’s public areas, we go to the Seawest Lounge aboard the BC Ferry Coastal Celebration and have some snacks and coffee. A modest fee is charged in this area, but it is nice and quiet, getting us away from the crowds, and the snacks and beverages are included. It is a cool and cloudy morning as we cross the Strait of Georgia to Tsawwassen Terminal. The bus goes directly to the cruise ship terminal and takes us right to the entrance, where we pre-clear US Customs and Immigration, go through ship’s security, and finally check-in to receive our cabin key cards. Boarding the ship after that is simply a matter of walking the gangways until we are aboard the Eurodam and have ship-board security scan our cabin key cards for the first time. Within 10-15 minutes after entering my cabin, my main checked bag arrives at the door, so I’m all set for the upcoming trip! I meet up with my friends in their cabin this afternoon while the ship is still docked. My friends found the bars aboard ship have a dozen beer on sale today, so we sit on their verandah watching the loading activity before our departure. I decide to find some lunch in the Lido, bringing a nice vegetarian sandwich back to their cabin to eat and have a beer with it! Later, we go out onto Deck 5 forward to watch Eurodam leave the dock and depart Vancouver harbour under Lions Gate bridge. I try out my GoPro Hero5 Black camera by taking a video time lapse with it all the way until we clear the bridge and sail past English Bay into the beautiful sunset. I’m also shooting with my Canon 6D dSLR since it is so beautiful as we leave port. When we go for dinner in the main dining room by 7:30PM, there is quite a line of people waiting, however we are seated within about 10 minutes or so and have a lovely dinner as the ship sails down Georgia Strait and the Salish Sea. I return to my room and work on my computer since I still have LTE and later 3G connection with my Canadian cellular service as we sail past Victoria to drop off the pilot and continue out the Strait of Juan de Fuca and into the open Pacific Ocean. The signal from the 3G lasts a surprisingly long time past Sooke! I guess it’s because I’m on the side of the ship facing the Canadian shoreline. Eurodam departs Vancouver from JoeTourist on Vimeo. 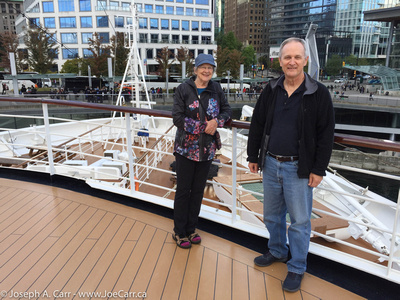 This entry was posted in British Columbia and tagged cruise, cruise ship, harbour. Bookmark the permalink.